One of the first questions we ask new clients is what they want to achieve for their communities. The answers are diverse, and often energy efficiency is not at the top of the wish list. Rather, it may be a need to modernize infrastructure, improve technology or find new revenue streams. One request we hear from mayors and city managers is a desire to support economic development goals. Economic development is often top-of-mind for cities seeking to grow and advance. These forward-thinking leaders often have plans that aim to attract new businesses, optimize tax revenue, and capture more wallet share, all leading to growth and prosperity. Our energy efficiency projects can help municipalities find funding to accomplish these economic ambitions. One of my favorite recent success stories is from the City of Tupelo, MS, a small city with a big personality. Recognized as the birth place of Elvis Presley, the city welcomes nearly 100,000 visitors each year to experience the place where ‘the King’ grew up. A team at play on one of Tupelo’s 27 sports fields with new competition-level lighting funded by energy savings. To capture more of this promising market, Tupelo’s leadership team identified sports tourism as a valuable niche market to pursue. In the temperate south, outdoor sports take place for most of the year and tournaments often span a week or longer, bringing together athletes, fans, and their families. These visitors stay in hotels, eat in restaurants and spend money in local shops, all boosting the local economy and creating new job opportunities for citizens. However, outdated facilities and aging equipment caused Tupelo to miss out on opportunities to capture the top tournaments. The goal was clear, but funding a project of this magnitude was a challenge – the needed improvements would cost more than the entire annual budget for the Parks and Recreation department. City leaders found a fiscally responsible solution through a turnkey energy efficiency project with Schneider Electric. Twenty-three municipal buildings, including City Hall, public offices, fire stations, community centers, and the police academy, were modernized. Upgrades to the HVAC and building automation systems increase the comfort for visitors and residents, while more energy efficient lighting improves the look and security at these facilities. In total, the project reduces the city’s utility budget by 18 percent, saving more than $140,000 in annual energy costs. That’s nearly $3 million over the life of the project that can be reinvested in the community. 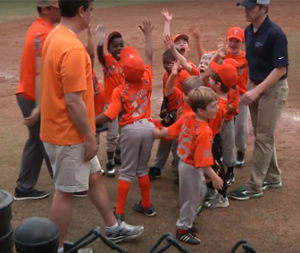 That savings made it possible for 27 sports fields in Tupelo to be upgraded with competition-level lighting used by most major league sports teams. These high quality facilities will act as a significant draw for top tournaments, boosting tourism and spurring local economic development by bringing new people to the city every year. After all, part of attracting tourists is having modernized, attractive infrastructure. 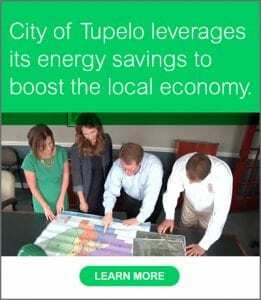 In addition to increased tourism, research by the American Council for an Energy-Efficient Economy (ACEEE) demonstrated that investments in energy efficiency improvements like those in Tupelo create jobs and have a positive impact on overall employment. When municipalities take on projects such as this, they provide an immediate boost to their economy and also position themselves as progressive and sustainable leaders in the region.